I’m a quarter Czech – East/Central European blood inherited from my father’s side of the family. At this time of year the roots become, if not stronger, then just a little more apparent. In a synthesis between English and Czech tradition, my family hold celebrations on both Christmas Eve and Christmas Day. Preparations for the former include the making of Czech cookies (crumbly chocolate hazelnut biscuits with orange zest for one set, and vanilla moons for another), cooking fish soup, making potato salad and frying schnitzel. These dishes are our modified version of Czech cuisine. There are stories of previous generations with carp swimming in their baths in the lead up to the event – but we just make do with shop-bought haddock. Similarly, the schnitzel is technically Austrian, but feels just European (and delicious) enough to suffice. All four of us dress up. This year I wore a vintage black dress with a velvet bodice and taffeta skirt that my mum had bought at a jumble sale when she was my age, offset with a vintage red belt from my Babi (you can see it on my Facebook page here). We set the table with candles, enjoy the meal and then head upstairs to peer from darkened windows to ‘spot’ the brightest star in the sky – even if it’s cloudy. Although my brother is now old enough to have unraveled the make-believe, we continue with the habit of one person staying downstairs to ‘clear the table’. A mysterious small bell is heard below and we descend for presents and further festivities. This ritual has taken place for seventeen years, beginning before I could walk. It has shifted now from something excitedly anticipated for days to a more practical occasion – one in which I can help with the cooking, but also the clearing up. Christmas in general has lost that month-long aura of glitter that it used to have; replaced with a deeper appreciation for several days of family, friendship and very good food. The sense of heritage is particularly strong on Christmas Eve though. It is a night when we share some of the actions played out by ancestors. During the rest of the year, my Czech encounters are limited mainly to my Babi’s (Grandma's) stories, and my own reading of Eastern/Central European literature. Knowledge of the language extends only to greetings, cheering another’s health, or insulting them with some raucous swearing. We haven't yet visited the Czech Republic, despite my desire to explore Prague. Of course, the other form of access to my family heritage is found in my wardrobe. My Babi - whose clothes are so often scattered across this blog - has been a rich source of dresses, coats, bags, belts and hats in the past few years. Her life has been equally measured out in tragedy and joy. In 1948 her family fled persecution in Czechoslovakia – my great-grandfather’s life in danger. They skied over the border disguised as tourists. As glamorous or dashing as that sounds, the reality was one of great hardship and subsequent suffering. Her mother, father and sister escaped with only the clothes on their backs and possessions in their pockets. My grandmother, who was at boarding school in Switzerland at the time, suddenly had to share the contents of her term-time clothes trunk with mother and sister. This meant only several pairs of knickers, one chemise and a limited number of garments between them. It wasn’t so much starting again from scratch, but starting again from stitch. To go from that state of loss through to amassing thrift-store-found couture and tailored coats with real Chanel buttons is the classic tale of rags to riches. But those relative riches were still hard won, never easily gained. 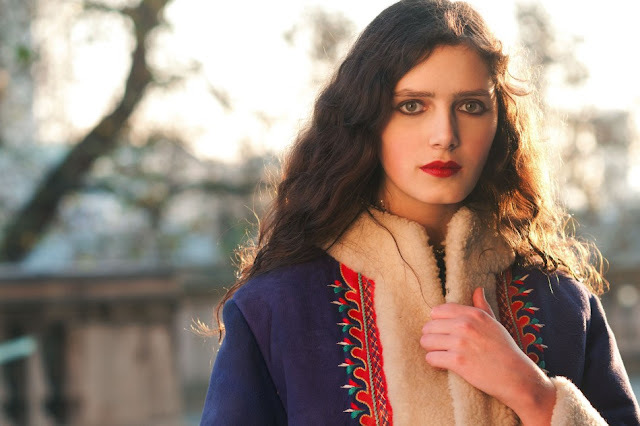 One of the riches recently given to me is this coat – a blue sheepskin beauty with Hungarian hand embroidery. My Babi’s husband (my late grandfather) bought it for his adored wife on impulse when they went to Innsbruck, Austria for the Winter Olympic Games in 1964. Little did she know then that within four years she would face the untimely death of her husband. But neither did she know that also in Innsbruck at exactly the same time, watching the Olympics was her far-in-the-future partner – a man that she would not meet for another nearly three decades. This stroke of serendipity, recognised only in hindsight, was enhanced when they later realized that a relative of this then young man was working at the shop where this coat was purchased. So it represents a bridge between old and new, past and present, taking on a new layer of resonance in being passed on to me. It felt a suitably warm and bright piece to wear for meeting Jason of Citizen Couture. I was forty-five minutes late for the visit to Somerset House to see both him and the delightful Vanessa, but the time- lag proved fortuitous. I arrived just as the golden curls of late afternoon sun had reached the sandstone. We moved around to the back, escaping the crowds at the ice rink, before heading down to the embankment beneath. The red door - perfectly matching the details of the coat - was discovered under the bridge. It was a very enjoyable afternoon of camera snapping and socialising. I paired the coat with a blue vintage dress, grey heeled vintage boots from eBay and a saddle bag also passed on to me by my Babi. This outing, the first time of wearing it, signaled a new beginning for this special coat – continuing the pattern of renewal and refreshment that my grandma has practised for her whole life. It seems an appropriate point to add that I hope everyone has a very happy new year full of festivities and cheer. I’m dizzily excited about what 2013 holds and am hugely grateful to all who have read, commented, emailed or otherwise interacted with this blog and with me in the past year. And finally on the theme of ‘renewal’, I wrote an article recently for Young Minds, about watching my dad go through extremely debilitating clinical depression. Roz, I just popped over after publishing my own post as I feel like I haven't read or commented on any blogs for a ridiculously long time. I loved this incredible story of your Babi - such real, social history wrapped up with the effects of war and politics - just fascinating. Your Christmas Eve traditions sound gorgeous - I do think it so important to have some mind of family tradition. I'm a quarter welsh yet all I have to show for it is a few numbers and expletives(!) and a love of singing. It's one of those things I suppose - if you don't make a point of embracing and savouring your heritage you lose it. I must say your Czech cookies sound delicious! You are so striking! I felt almost envious scrolling down these gorgeous photos, and the way you write is so careful and beautiful. It has been so interesting to get that little insight into your Babi's life and you tell the story so wonderfully. Roz, you are so many kinds of wonderful. I hate to gush on and on (and on and on and on) but I relish your pics, and your writing so much! I loved this outfit from the get go- (I have a softness for what I term Dr. Zhivago dressing) and that coat is something I would covet for my own wardrobe! I love the colors, how you styled it, but best, I love the descriptions- the meaning and the story of the jacket add so much more to a mere pleasing bit of outer wear- I am touched by it being a bridge three fold: first the grandma and her two loves, second you to grandma, and lastly for us- you cast a walk way between the real and the fantastic and let us walk along its hemlines. All the best for the New year, my beautiful Rasalind. What a beautiful coat, clearly cherished and so stunning on you Roz. I love your descriptions of your family's christmas traditions. And I was moved to read the piece you wrote for MIND, it's very hard seeing someone you love going through a depression and I'm so glad your father is feeling more himself again. Hi, good post. One thing, technically Czech Republic is in Central Europe, not Eastern. I was born there and majority dislake to be called "eastern europeans". Definitelly Prague is worth visiting, its architecture was preserved during the war. Striking is a perfect word to describe you. If I saw you walking down my street, I wouldn't hesitate to admire your beauty! The story was beautiful. I felt as though my heart strings were being tugged. It's always nice to hear of people's rich history. You write so well with a wisdom beyond your years and, on a more frivolous note, i love that coat! This coat is so beautiful. I love things that remind us of our heritage and have a story. Aside from this, I have few links with my family. I mean, I see my extended family from time to time, but I don't really know anything about it, I don't know the smallest stories of our past and nobody tell me anything when I ask because "you don't know this person" or "it will not interest you". That's for the family that lives in France; I'm also part romanian from my dad, who is in Romania since my birth, so I never actually talked to him and it's like it's not actively a part of myself. The fun part, I never knew that my mother's side was jewish before one or two years! Since I learned more about judaism, even though I don't believe in a god, I like some sides of the religion. Weirdest part, this summer my mother told me to dress differently because "people are going to believe you're jewish, they're looking at us" like she was ashamed (THERE WAS NOBODY! ), and made me get in the car. That and despite being sort of an atheist, still made me get baptized. That and if someone has something "shameful" to them (example: depression) in the family, we do not talk about it. Ever. Even if I personally don't find these things shameful. Families are the weirdest things. Happy new year! Your blog always get me so introspective! Let's say that's an achievement by itself, making people think. Festive coat. Looks warm and beautiful. It's wonderful to wear something with a past, a story to tell - as well as keep one's cultural traditions going, despite time's passage. Happy New Year 2013, dear Rosalind!!! Happy New Year! I think a year ago I left some similar comment on your Christmas post last year so perhaps I am going to repeat myself. I havent checked but I think you spoke about some of your traditions then too. I am with you on the glitter being replaced by food. No longer the early morning stocking and running round the house begging to open presents. I did so much baking with my mum over Christmas! I loved helping make Christmas happen (humming 'Making Christmas' from Tim Burton the whole while. I dont think it has become less special, just different-special. I am always intrigued by other people's traditions and your story of Christmas is so beautiful to read. What a rich heritage your family has, and wonderful that the tradition is kept alive! That tale of serendipity brought tears to my eyes. I have no heirlooms particularly. My fondness for natural and local textiles comes with a craving for knowing their history, that garments provenance, or story. 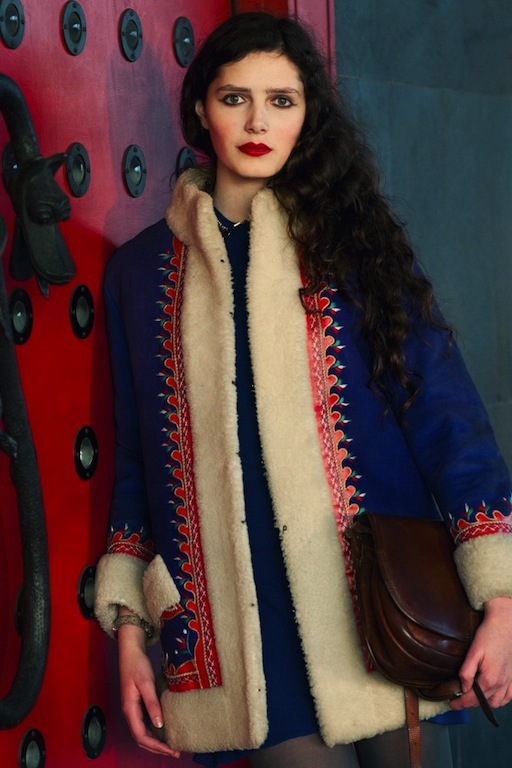 How wonderful to think of your grandmothers tale of love lost and regained whenever you slip on this beauty of a coat! Happy new year :) wonderful pictures too, looking at them I can't tell if they were taken 3 decades ago or 3 weeks ago! I hope your New Year festivities were exuberant. You look ravishing in your blue coat and red lipstick. My maternal grandfather was Czech, although born here. My mother would make kolaches every Easter with prune or cottage cheese filling. I remember visiting my grandfather and trying jaternice, a Czech sausage. Sending love to you and yours!! I love Christmas especially because it's so steeped in tradition and ritual. My family has an innumerable (unaccomplishable) list of traditions and adds new ones without thinking about it all the time. Your family history certainly sounds fraught and interesting. I'm sure it wasn't glamourous in the least, but like many of these things, makes for good telling afterwards. What beautiful pictures, love the lip colour and you are so pretty. Very happy to have stumbled upon your blog! You write very well too! You are really looking so pretty. Great post. How easy to romanticize pain and/or tragedy, yes. Like stones on a beach, the rough edges get worn off so they don't cut any more I suppose. The coat is absolutely a treasure and you wear it with such beautiful fierceness. I must say I fell in love with Prague when my husband and I went there. Charles Bridge in the mist was like something out of a fairy tale. And as was my habit during travels, I brought home Czech crystal, my favorite being gilded, jewel-hued goblets that look so regal, I use them every Christmastime. What a lovely history your coat represents. It isn't only beautifully stitched on the outside. It's as if its threads also embroider your family's stories together. Speaking of your family, I just noticed your dad's battle with depression. This is also a story I live with in my family. I'm very sorry for what your father is going through, and what everyone close to him experiences. I haven't read the piece you wrote yet but I shall. I love your coat! It's beautiful! I'm kind of proud to have the same origins as you :-) although I'm actually 100% Czech. You should definitely visit Prague (avoiding high season i.e. May-September! ): the atmosphere is very striking, melancholic and magical, especially during Fall,I can picture you there easily. I bet it would be an enriching experience for you. Also, congratulations for your wonderful and intelligent blog!